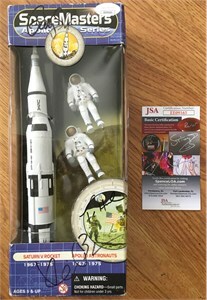 Apollo Saturn V Rocket toy made by SpaceMasters autographed in black marker on the packaging by Apollo 13 movie stars Kevin Bacon, Tom Hanks and Gary Sinise. Packaging has minor to moderate wear. Obtained in person, with certificate of authenticity from AutographsForSale.com. ONLY ONE AVAILABLE FOR SALE.